If the universe is infinite, either in space or time, or if there is an infinite number of finite universes, or if there is even one actually existing infinite universe sufficiently like our own, then any event of finite probability will occur an infinite number of times (given certain assumptions about cosmic diversity). The spontaneous congealment of a brain from relatively disorganized matter, by sheer quantum or statistical-mechanical chance, is often held to have a very tiny but finite probability. Following recent tradition, we can call this entity a Boltzmann brain. If the universe is infinite, then, I might expect there to be an infinite number of Boltzmann brains molecule-for-molecule identical to my own, thinking the same thoughts as I do and having the same feelings as I have. If you think, as most philosophers do these days, that some form of externalism is true, then maybe a lone Boltzmann brain can't have exactly my thoughts. It couldn't think about my wife, for example, since it has never met my wife. No matter: Suppose that there is some minimal section of brain-plus-body-plus-environment that is constitutively necessary for a being to have thoughts qualitatively identical to my own. There will be an infinite number of randomly congealed Boltzmann beings that meet those minimal conditions. For convenience, I'll still call them Boltzmann brains. Now the fate of a Boltzmann brain is very likely to be different from the fate I envision for myself. The odds of simply a brain randomly congealing while the rest of the surrounding matter stays disorganized are massively higher than the odds of an earth-and-sun system congealing full of durable life and society. Setting aside some concerns about probability with infinite cases, it seems reasonable to conclude that the odds are miniscule that a Boltzmann brain will live more than a few minutes, or maybe hours if a fair chunk of environment is assumed. If only a brain is assumed, then virtually right away things will go wrong: My optic nerves won't be stimulated by well-structured light. I won't feel like I'm breathing. If I'm in a churning soup, my brain will start tearing apart. If I'm in a near-vacuum, my brain will do whatever unpleasant thing brains do in near-vacuums. If some environment is assumed, right away it will start to crumble. The oxygen will start to dissipate into space, or gray goo will start to ooze through the walls. Should I worry that I might be a Boltzmann brain? The odds seem rather hard to assess. By stipulation, the Boltzmann brain differs from the me that I would prefer to think I am, as of right now, not at all in quality of experience, including apparent memories. The subjective probability judgment seems to depend, first, on the odds that the universe is infinite in the relevant sense. It seems reasonable enough, and common enough among cosmologists (if I'm right that cosmologists exist) to think the universe might be infinite. So let's call it 50-50, for all I can tell. Given the non-trivial possibility of an infinite universe, the issue then seems to turn on the odds that this sort of qualitative experience that I'm having right now (and whatever else is in the relevant, non-question-begging evidence base?) would arise from a non-Boltzmannian process of cosmological formation with an earth and sun, human society, and biological birth, as opposed to arising through Boltzmannian chance. How confidently can I assess those odds? Maybe one way to think of it is this: Given some arbitrary huge-huge-huge but not infinite chunk of the infinite universe, what should I expect the ratio to be of beings qualitatively identical to me that arise through normal cosmological Big-Bang-to-now processes as opposed to Boltzmannian chance? Hm! It doesn't seem to me that I really can in good conscience justifiably say that I know that the ratio whoppingly favors the me I think I am. How many Eric-Schwitzgeblian lives will there be in in that huge-huge-huge arbitrary chunk as opposed to Eric-Schwitzgeblian Boltzmann brains? I really have no idea! I'm tempted again, to call it even odds for all I can tell, but maybe it's better to say I just don't know. It seems, then, that I can't dismiss the possibility that I am a Boltzmann brain. Sometimes I think about this when I wake in the middle of the night or when I'm driving down the freeway and my mind is wandering. Or at least I am now experiencing apparent memories of that sort. Different classical Chinese philosophers have drawn different amounts of discussion in the Anglophone world over the past seventy years. I want to look at this phenomenon quantitatively and then suggest a general conjecture about the history of philosophy. The six target philosophers include two who are well-known in the Western world outside scholarly circles, Confucius and Laozi (aka Lao Tzu), and four who are much less well known, Mencius, Zhuangzi, Xunzi, and Mozi (aka Mengzi, Chuang Tzu, Hsün Tzu, and Mo Tzu). Below is a graph of their "discussion arcs" -- that is, the rates, times 1000, at which their names appear in keyword (including abstract and title) searches in Philosopher's Index, divided by a representative universe of articles. Click the image for a clearer view. I don't interpret as meaningful the apparently very tight match of the lines at the end of the graph -- but the approximate match does seem meaningful. In the 1940s-1970s, Confucius and Laozi combined received about twice as much discussion as the other four philosophers combined. Starting in the 1980s or 1990s, that situation changed. 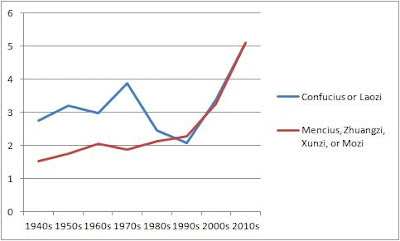 My general conjecture is this: As a subfield in the history of philosophy matures (as I believe the history of Chinese philosophy has done in the past couple decades), proportionately less expository attention is devoted to the most famous headline figures and proportionately more attention is devoted to less well known figures. This is a kind of "winnowing of the greats" in reverse. If that conjecture is correct, we ought to see the same effect in other subareas of the history of philosophy. If contemporary analytic philosophers are to believed, "propositional attitudes" are a central feature of mentality, perhaps the central feature. What is a propositional attitude? It is a mental state like belief, desire, intention, hope, fear, etc., that can take a full proposition -- speaking loosely, a sentence -- as its complement. I can believe that grass is green. I can desire that we eat cookies. I can hope that aliens will rescue us soon. The mainstream view is that human action arises from the confluence of our beliefs, desires, intentions, and other attitudes. Now there's a funny thing about how philosophers discuss propositional attitudes. When we list the canonical propositional attitudes we always seem to list belief first. Why is that? Is belief more propositional or more psychologically important an attitude than desire or intention? Not according to conventional wisdom. Also, desire always seems to be listed second. After that, it's a grab bag. This is not just a quirk of conventional linguistic ordering. Philosophers studying propositional attitudes also typically analyze belief first and most centrally, desire secondarily if at all, and other attitudes only haphazardly. The literature in philosophy of language on "propositional attitude reports" (i.e., sentences like "Lois believes Superman is strong") is especially striking in almost always using only belief examples. The Stanford Encyclopedia entry on Propositional Attitude Reports might be typical. A search within the page yields 183 hits for "belief", 169 hits for "believe", and 2 hits for "desire". The two occurrences of "desire" are not examples of desire reports, but rather gestures toward an interest in propositional attitude reports generally, including desire. This monomaniacal focus on belief despite an advertised general interest in propositional attitudes seems, on the face of it, likely to be distortive. Things might go differently, in some ways, for belief than for other propositional attitudes. It's risky to generalize from a narrow range of cases, especially if other people in your subfield are also generalizing from the same narrow range. I thought it might be fun to quantify this "belief first" distortion. So I set up a grudge match between belief and desire in philosophical work on propositional attitudes. Belief enters, of course, as the heavy favorite. Here's what I did. I downloaded all the entries in Philosopher's Index that included "propositional attitude*" in a keyword/title/abstract search. Within those entries, I looked for appearances of "belief*", "believe*", and "desire*". (I needed only one search term for "desire*" since same word serves as both verb and noun; the asterisk is a truncation symbol.) If both "belief*"/"believe*" and "desire*" appeared in the same entry, I recorded which term appeared first. Here are the results. The total number of "propositional attitude" entries was 616. Of these, 382 contained neither "belief*"/"believe*" nor "desire*" in the keywords/title/abstract. (Most of these will presumably discuss belief and/or desire in the body, but the abstract is framed more, shall we say, abstractly.) Of the 234 entries that mentioned either belief or desire, 182 (78%) only mentioned belief, 13 (6%) only mentioned desire, and 39 (17%) mentioned both belief and desire. Among the 39 mentioning both belief and desire, belief appeared first in all 39 cases. Final score: belief 221, desire 13. Belief wins, with blood on the moon! Tim Schroeder, time to get back to work! One of the highest forms of recognition a philosopher in the U.S. can receive is the presidency of an APA division. Lists of the APA divisional presidencies thus provide information, not filtered through current lenses, of people who were regarded as prominent philosophers in their day. 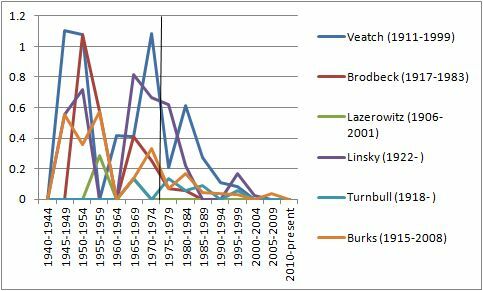 If, like me, you have a kind of morbid curiosity about the fleetingness of academic fame, you might wonder what becomes of these divisional presidents. Lists from the 1930s and 1940s are almost entirely names I don't recognize: Albert Perly Brogan? Marten ten Hoor? In several past posts, I have used the concept of a "discussion arc". A discussion arc for a topic or a philosopher is simply the number of times the topic or philosopher appears in a keyword search (including title and abstract) in the Philosopher's Index, divided by some representative number of the universe of articles. 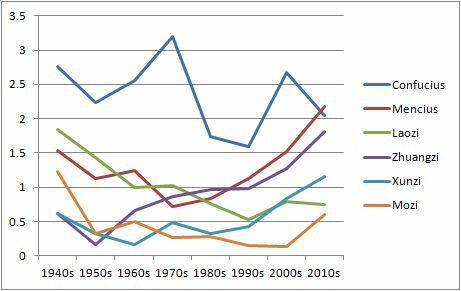 Some topics and philosophers have fairly steady rates of discussion over the decades (dualism, Kant); others show sharp temporal peaks (ordinary language, Chisholm). 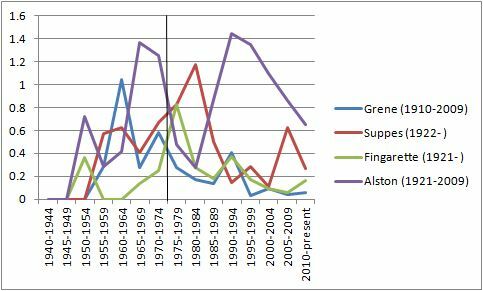 I have found that, in general, twentieth century Anglophone philosophers' discussion arcs tend to peak at around age 55-70. 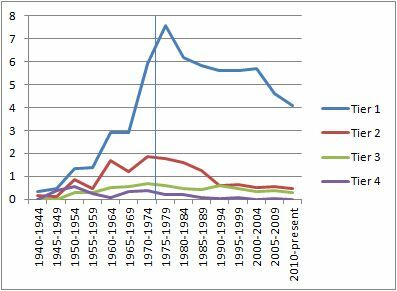 Around 1975, most of this group had similar discussion rates (though John Rawls rather more). Most arcs show the typical hump shape with peaks at around ages 55-70. 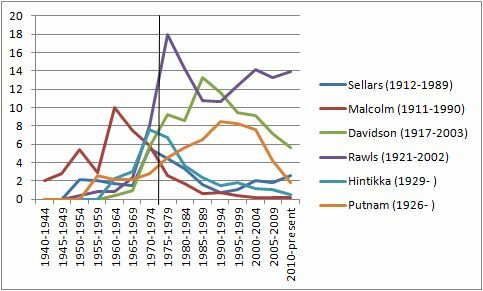 The declines of Jaakko Hintikka and especially Norman Malcolm (both of whom peaked a bit young) are notably more severe than the others. 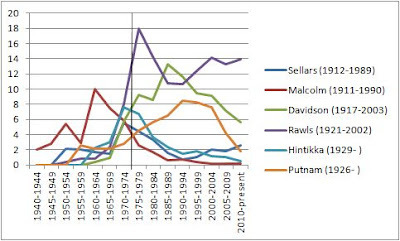 Rawls and Wilfrid Sellars show bimodal distributions, with the typical late-career peak followed by a more recent resurgence. 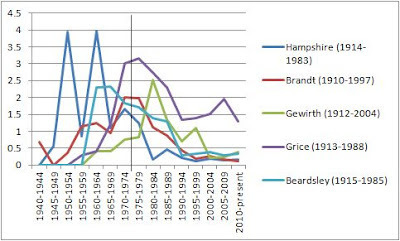 Although the data are noisier, as one might expect with fewer data points, all five show the typical hump-shaped arc, though Stuart Hampshire peaks a bit earlier than typical and Alan Gewirth a bit later. Paul Grice appears to have had considerably more staying power than the others, though his recent discussion rate of about 1.5 remains lower than all in the first group except Hintikka and Malcolm. 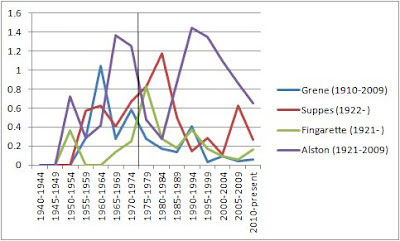 Four more 1970s APA divisional presidents, while peaking below 1.5, still continue to draw a bit of discussion, with William Alston and Patrick Suppes recently exceeding all in the mid-tier group except Grice. In fact, the decline is much less sharp, on a percentage basis, for the Tier 1's than for the lower tiers, which might be partly explained by my hypothesis about the Winnowing of Greats. The spread also seems to be clearly evident by the early 1960s, when these philosophers were in their early 40s to early 50s -- maybe even earlier. 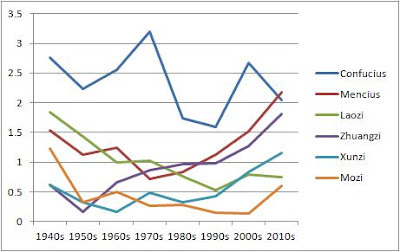 We can to a substantial extent predict discussion rates in the 2000s, among APA division presidents from the 1970s, based on those presidents' discussion rates in the five-year span during which they turned 45. If we rank their age-mid-40s discussion rates and also rank their discussion rates since 2000, the ranks correlate at r = .59 (p = .006). Nine of the 21 are ranked very near their age-mid-40's discussion ranks (within 2) and 13 are within 4. The biggest outliers are Malcolm (fell from 2 to 12), Donald Davidson (rose from 12 to 2), and Grice (rose from 14 to 5). 1. William Thomas Jones, John Wisdom, Lewis White Beck, Alonzo Church, William Henry Hay, Ruth Barcan Marcus, Kurt Baier, Wesley Charles Salmon, and William Craig. Also: I hand-culled false positives in any five-year period in which the target philosopher generated 40 or fewer keyword hits on a truncation-symbol appended version of his last name (e.g., Lazerowitz*); for those with 40 or more keyword hits, I spot-checked for problematic patterns. 2. Search term: KW=ethic* or KW=moral* or KW=politic* or KW=language* or KW=epistem* or KW=mind* or KW= metaphys*. Ethics professors don't appear to behave any better than do non-ethicists. (See here for my most recent work on this topic, collaborative with Josh Rust.) On what I've been calling the "inert discovery" model of philosophical moral reflection, moral reflection nonetheless still tends to lead to the discovery of moral truths. It just has no improving effect on one's personal behavior. So, for example, philosophical moral reflection might lead one to think that eating meat is morally bad (which indeed a majority of ethicists do seem to think), but without any material effects on one's cheeseburger consumption rate (as my studies also seem to show). Now, on the face of it, the inert discovery model has seemed to me empirically somewhat unlikely. If one discovers that something is morally bad, shouldn't that add to one's motivations not to do it? And shouldn't one then, on average, do it a bit less? Shouldn't coming to believe that eating meat is morally bad slightly reduce, at least on average, one's cheeseburger consumption rate? Here's one possible way, though, to make the inert discovery model work. Plausibly, most people do not -- despite the classic Dixieland song -- actually wish to number among the saints. Instead, maybe, most people have what we might think of as a moral thermostat. We want to be about as morally good as our neighbors, or maybe (in our perhaps somewhat deluded self-conception) somewhat better, or at least not among the first-class jerks. (Different people might have different thermostat settings.) If we do have moral thermostats, that would explain the moral licensing effect -- the tendency to be more likely to do something a little morally bad after having done something a little morally good. Once you have met or exceeded your target level of moral goodness, you can then better justify getting away with some small violation. And to a large extent, for most people, this moral thermostat might be comparative: If other people are cheating, it is easier to justify allowing yourself to also cheat than if no one else is cheating. Who wants to be the sucker saint? So maybe, then, if an ethicist who comes to accept high moral standards against eating meat, and in favor of donating large amounts of money to famine relief, etc., does not adjust her moral thermostat relative to others, her behavior will not change despite the moral discovery. She wants, say, to be morally better than 80% of those around her. And even before discovering the badness of eating meat, she conceptualized herself that way. Now, if she ceases eating meat while others do not, she will be (in her own conception) better than, say, 85% of others -- heading too far toward sucker-saint territory for her own tastes. Thus, the result of an ethicist's accepting high moral standards would be not an improvement in personal behavior but rather the adoption of the view that both she and other people are morally worse, by absolute standards, than she had previously thought.